Navigation cluster, pointer mapping off register? When I attempt to use the navigation cluster in the upper right corner, it frequently "stops working" because my mouse has shifted a little. The pointer is still over the relevant arrow, but clicks are not intercepted / interpreted. This can be identified before clicking because the highlight color (light blue) disappears when the pointer moves to an area where a click will not register. It is particularly noticeable on the curved rotation arrows at the top; but all items are off register. Is this a known issue? Re: Navigation cluster, pointer mapping off register? Your FreeCAD info shows a fancy version number, ist this an official 0.18 version or did you compile yourself? I've found the arrows require the mouse pointer to really point to the inside of the arrow. Pointing on the perimeter doesn't work. I wish there would be a "fuzzy zone", maybe 2 or 3 pixels around the arrow where the mouse would still be detected. 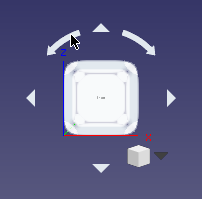 But there's another bug for me, which may or may not have appeared after the switch from Qt4 to Qt5: The navigation cube is supposed to be movable with the mouse, but I can't move it. It's still movable here on the Ubuntu version mentioned above. It is the latest from the PPA but still 5 commits behind yours. Where do you pick to move it? On which corner is it located in your 3D view? To be clear: by movable, I mean that I could take the whole NaviCube widget and drag it to another location in the 3D view, for example from the top right corner to the bottom right corner, without going to the preferences. I mean that I could take the whole NaviCube widget and drag it to another location in the 3D view, for example from the top right corner to the bottom right corner, without going to the preferences. Doh! I tried everywhere around except clicking directly on the cube. Ok, it's working for me. It's one I built. The latest version available for fbsd is 0.17 and none of them are "official" builds. If I have the axonometric view set, when I press on the middle of the navigation cube, it does not move until the pointer leaves the cube. So it appears to not be moveable unless you move the mouse a significant distance. There is an obvious circle in the middle of the cube, which is used to set one of several axonometric views depending on the current orientation of the object. If you are already looking at that axonometric view, the area appears to be non-functional. Similarly, if a single face is showing, the face appears to have no function, and I still need to drag to the edge of the cube to get it to move. This should not be necessary. A clear distinction can usually be made in terms of intent when a user presses and drags, vs. clicks (presses and releases) a mouse button (Modulo some small delta to allow for shaky hands). That distinction is apparently not being used for navigation with the nav cube. To be clear on the registration issue: If you place the pointer where it is in the image below, do you see a blue or a white background in the curved arrow under the pointer, and if you click does the 3D image rotate? In my case, the background is white, not blue, and the image does not rotate. Note that the pointer is well within the underlying arrow image; if it is moved lower the background will turn blue and it functions correctly. I can also get the various parts to highlight blue and function by moving the pointer near them (generally below), but not actually inside them. I was going to do that, but wanted to understand how it's supposed to work first.